Probably the most famous catch phrase to come from an infomercial is “Set It and Forget It” from the Ronco Showtime Rotisserie infomercial with Ron Popeil. I would have thought that his motto was so well known that nobody would ever try to copy it. 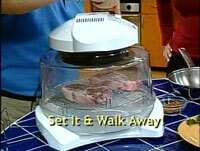 That, however, is not the only catch phrase promoted by the Flavor Wave Oven Deluxe infomercial. In addition to the stolen motto, they promote a motto which is downright strange: “I See the Light.” I suppose “I See the Light” obliquely refers both to the halogen light that produces the infrared cooking waves as well to some amazing moment of realization that the FlavorWave Oven Deluxe is superior to other cooking methods. However, when people hear the phrase “I See the Light” uttered endlessly on this infomercial I doubt many have a clue what it is supposed to mean. Is that creepy or what? “I See the Light” is surely one of the lamest, oddest, and most convoluted infomercial taglines of all time. It’s more reminiscent of the mantra of a religious cult than something designed to sell a kitchen appliance. I suspect that some advertising wizard came up with the idiotic slogan “I see the light,” thinking it was oh so witty and clever. Then someone else realized how confusing and pointless it was and decided to steal a page from Ron “King of Infomercials” Popeil by using “Set It & Walk Away” as well. Why are you making a big deal about ron popeil. Who cares if his speech was stolen. I have one of these ovens and it works nicely. I use it all the time. As far as ron popeil slogan being stolen that is no concern of mine. I would be more interested in the thing working. It does work. I watched this infomercial last night and I am convinced the reason they keep saying “I See The Light” is because this is the Flavor Wave DELUXE. As they point out themselves, the original Flavor Wave did not have the halogen light. The new Deluxe model does. They make a point to keep referencing the light because that is the big selling point between the old and new model and in order to get all those people who a year ago bought the old one to buy the new one, they have to constantly point out what makes it special. Just want to point out your spell-checker popped in “released” instead of “realized” in the last sentance there. Thanks for pointing that out. I’ve made the correction.